Diabesity is the scientific neologism identifying one of the main focuses of investigation of the Italian Diabetes & Obesity Barometer Report. 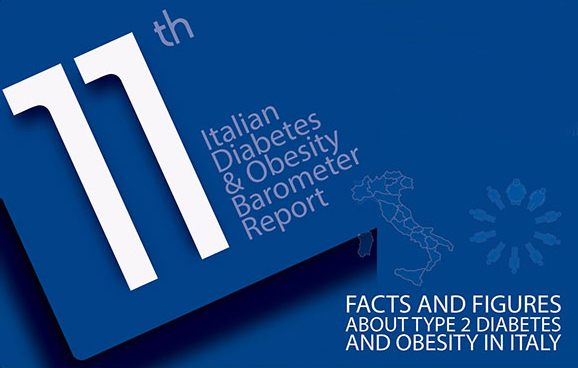 The 11th edition of the extensive and in-depth document promoted by IBDO, the Italian Barometer Diabetes Observatory Foundation, has recently been published and presented by the large group of diabetes experts participating in the project. Even this year, the CORESEARCH team led by Antonio Nicolucci actively contributed to the Report. The coexistence of diabetes and obesity, the “diabesity” in fact, affects two million Italians, mainly affected by type 2 diabetes, which is an alarming amount, if compared to the Italian National Institute of Statistics (Istat) 2016 survey which estimates 3.200.000 diabetes diagnoses in Italy. Obesity itself is one of the most relevant risk factors for diabetes. The Report shows that 44% of type 2 diabetes are attributable to a state of obesity or overweight. Furthermore, it is documented that compared to a person with diabetes and normal weight, patients with diabetes and overweight have a doubled risk of death within 10 years. This risk has a 4-fold increase in the obese person with diabetes. In the last edition of the report the analytical focus on the diabetes status in the various regions of Italy is one of the most important aspect. The statistics define a very varied picture with many peculiar critical characteristics. At a territorial level, a North-South gradient is evident, for which the prevalence rates of diabetes are 5.9% in the southern Italy, compared to 4.0% in the North-West and 4.1% in the North-East. The highest values are reached in Calabria, Basilicata, Sicilia, Campania, Puglia, Abruzzo, but also in some regions of the Central Italy such as Lazio; the lowest ones are in the autonomous provinces of Trento and Bolzano and in Liguria. Even for mortality, the geography confirms the same pattern, with a greater penalization of the South. The onset of diabetes is favored by unhealthy habits and lifestyles such as physical inactivity and poor diet, which can lead to obesity or low attention to programmed medical visits. In this regard, the Report correctly emphasizes the issue of childhood obesity, with a regional trend in line with the already observed North-South gradient. The incidence of the risky condition for young people is particularly widespread in the southern regions: Campania (36.1%), Molise (31.9%), Puglia (31.4%), Basilicata (30.3%) and Calabria (30%) compared to significantly lower values such as those observed in the autonomous provinces of Trento and Bolzano (15.4%). Furthermore, the social groups most affected by diabetes are those with a low educational level or poor economic resources. An adequate methodological and statistical approach has outlined the socio-economic profile of the person at risk of diabetes. This risk is double among adults aged 45 and over with at most lower secondary school license compared to graduated adults and increases by about 20% among those who judge the economic resources of their family as insufficient. A further topic offered by the Report is the assessment of the link between urban life and type 2 diabetes and obesity. Today, more than 65% of people with diabetes live in big cities and the so-called urban diabetes is an emerging public health issue in Italy considering that the 36% of the Italian population is located in the 14 metropolitan areas , including around 1.2 million of people with diabetes. Dr. Maria Chiara Rossi from CORESEARCH is one of the authors of the Barometer Report, and she helped clarify the most important aspects of interest emerging from the document. Dr. Rossi, compared to the evidence already emerged in the last year Report, what are the relevant news and what the confirmations published in the 11th IBDO report? Basically, it is confirmed a persistent and alarming increase trend in the prevalence of diabetes and obesity: this represents a serious risk not only for the health of millions of Italian citizens (over 4 million in the coming years) but also in terms of sustainability of the national health system. The Report, however, is based on a system of collecting and reviewing clinical and socio-cultural data that will form an in-depth tool for mapping the issue and stimulating possible solutions. One of the most important aspects of this report is certainly its perspective on the analytical status of diabetes in the regional realities. Why did you choose this study approach? The Barometer Report is a useful starting point to identify the priority areas of intervention to counteract the pandemic of diabetes and obesity. Clearly it is necessary to act on risk factors, such as incorrect lifestyles and socio-cultural barriers. Since issues are strongly influenced by the variety in the various areas of the country, each region should be evaluated using their own data, identifying specific improvement strategies. From a researcher’s point of view, can you highlight the grey areas or the most inconsistent data emerging from the analysis? Certainly, the urgency of tackling the problem of geographical inequalities. All citizens have the right to equal access to quality care, but the prevalence data of diabetes and obesity oscillate considerably in the different Italian regions. For diabetes, we have a prevalence that varies between 3.2% and 7.9%, with a clear North-South gradient. In parallel, the problem of the body weight concerns from 35% to over 50% of citizens in different regions. In the southern regions, 50% of resident is overweight or obese. In addition. another alarming data is the lack of homogeneity in diabetes mortality rate, which ranges from 10 to 25 per 100,000 inhabitants in regions such as Valle D’Aosta, Trentino Alto Adige and Friuli Venezia Giulia and between 39 and 55 in the southern regions. The report confirmed the existence of a branched and excellent Italian diabetic network, but also recognized the crucial role played by the interaction between diabetologists and GPs . Is this collaboration an established model or does it still need to be developed and refined? In the last few years, many steps have been taken on the topic of integrated care, but even in this case, unfortunately, the geographical variability prevails. Italy has a National Plan of Diabetic Disease that contains all the “ingredients” needed for the development of a model of chronic care patient-oriented. The efficacy of the model is widely recognized, but the implementation within the regions presents considerable difficulties and disparities related to organizational barriers, availability of resources, etc. In short, there is still a lot to do. The concept of pandemic is now widely accepted and the report highlights a close correlation between the incidence of diabetic disease and living in large urban areas: what are the main features of this aspect? Data from the Rome Changing Diabetes initiative have been merged in the analysis of the Report, showing us that inequalities are present not only among the regions, but also between neighborhoods in the same metropolis. For example, in the 8 health districts of the Rome metropolitan area, the prevalence varies between 5.9% and 7.3%. Recognition and analysis of existing data has shown a close correlation between prevalence of diabetes and socio-economic status and lifestyle indicators, such as level of education, unemployment rate, use of slow mobility/private transport and old age. Paradoxically, in the metropolitan area of Rome, in some districts in which the average age is higher (i.e. downtown) the prevalence of diabetes is unexpectedly lower. Therefore, older age is not the major responsible for the prevalence of diabetes if compared withsocial inequalities and urban structure. These data are very important because they create a “model case” that allows us to investigate the relationship between diabetes and territory, useful for the development of new urban health welfare policies. This is a new way of looking at diabetes, in which the person affected by diabetes and the available health facilities are considered related to the surrounding environment. With the same approach, other Italian metropolitan areas will be studied to reduce the “city risk” trend as a risk factor for diabetes and its complications. In view of the importance of lifestyle, cultural and socio-economic factors against the “diabesity”, how important is the development and the implementation of specific educational programs in primary schools? Investing in children is crucial, also considering the huge issue of overweight and obesity among primary school students and the fact that obese children will presumably be candidates for diabetes in adulthood. The initiation of information and prevention policies is very complicated. Promoting the culture of healthy eating and physical activity among children and young people and encouraging the development of cities where children and young people can live in a healthy way are the most powerful weapons at our disposal to reverse this trends.